Now, if you have not been in the United Methodist Church for long, you may not get this joke. We Methodist are known primarily for two things: (1) singing and (2) eating. The potluck supper, like we will be having on Saturday before the Confession of St. Patrick one-man show, is a staple in many United Methodist congregations. We should not be ashamed of that. 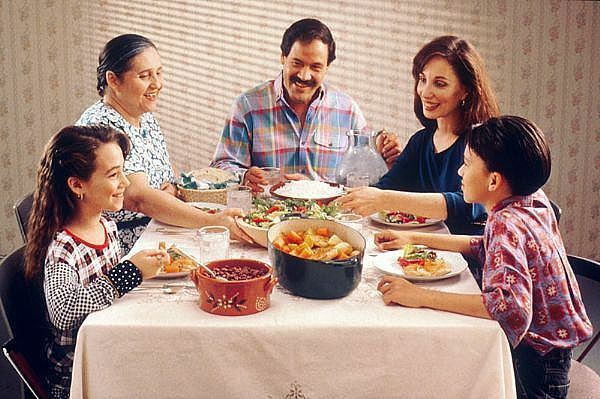 Eating together is an important part of the church’s life, and it always has been. In fact, it may be one of the most important things we can do together. You may remember several weeks ago, I preached a sermon where I used this picture of the banquet table in the Dry Run Creek Sewer as the very first slide. In telling you how much I liked the picture I said that I had written a series of sermons on the tables in the Bible and if I ever had an opportunity to publish that series, this was the picture I wanted for the cover of the book. I think it is a Kingdom of God image. 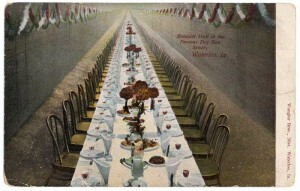 A banquet table in such an earthy place. When Pastor Bob told me earlier this week that he might not be able to preach today, my first thought was, “Oh he’ll be fine. I don’t really need to worry about preaching.” But just in case I began to think about old sermons that I might adapt if he couldn’t go today. Because we are celebrating the Sacrament of Holy Communion every Sunday during Lent, I began to reflect back on that sermon series on the tables in the Bible. Well, “just in case” happened. I remember thinking, “that’s an odd detail to include.” Of course they ate. Everyone needs to eat to survive. So why include that in this description of the early church? Seems like extraneous information. But then, as I reflected on Jesus‘ ministry, I realized they got this idea from him. Have you ever noticed how often Jesus eats and talks about eating in the Gospels? Jesus taught that the Kingdom of God is like a banquet. He attended dinners with Pharisees and other religious leaders. He told stories that ended with people celebrating by “killing the fatted calf” – world-class barbecue table. He fed 5,000 people in a field – a world-class picnic. He went to the home of his friends Mary and Martha where there is some squabbling over responsibility for preparing a meal. His disciples get in trouble for picking food on the Sabbath. His critics accused Jesus of being a glutton. Even after his resurrection, the disciples tell a story about Jesus cooking them fish for breakfast on the beach, and how two people recognized Jesus when he began to share a meal with them. And this isn’t only a Jesus thing. Moses and the Israelites talked quite a bit about food in the desert. Elijah was provided for by a widow who barely had enough flour for her and her son. Abraham finds out that he is going to have Isaac after he invites three travelers to have dinner with him. So maybe the casserole dish is not such a bad symbol of our faith after all. There is something about a meal together that matters to God. 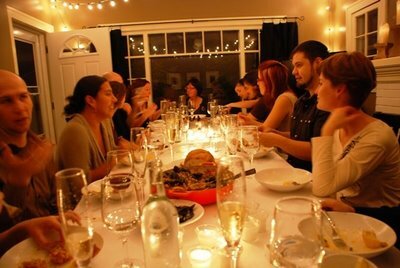 If you want to know how to open a dinner party, follow the example of Jesus. Imagine telling your dinner guests, “You have no idea how much I have looked forward to this dinner with you.” Maybe you have said this on a Friday night, at the end of a busy week when you have friends gathered around your table. Or maybe you have said something similar to your family after a business trip, or just a crazy Tuesday, “You have no idea how good it is to sit down with you.” Or maybe you have felt that at a wedding – how good it is to celebrate this couple’s love. Imagine how welcome would you feel at someone’s table who started the meal with those words. Because, face it, there are some tables at which we fill incredibly welcomed, and there are others where that is not exactly the case. When I was a kid our family had two weekly rituals. We spent every Friday night at my grandparents from my mom’s side, and every Sunday afternoon with the grandparents from my Dad’s side. One thing they had in common was that the majority of the time visiting was spent around their tables. I’ve told you before about the Sunday’s with the Italian Iovino side of the family. Dinner started early, and often went long into the evening. It usually started with antipasto, which literally in Italian means, “before the meal” or the appetizers. Then would come out the best Italian food I’ve probably ever eaten. Lasagna, homemade ravioli, braciole, and whole host of others. Later there was wine. Then dessert and espresso. The evening usually ended with a game of cards – pinochle or poker. All of this happened at the dining room table. My dad sat there for what seemed to a 7-year-old to be FOREVER. Now, I only know about most of that as a spectator. You see, after dinner, we kids were dismissed from the table. We would be called up to grab our dessert, but then we were to go back out into “the other room,” where we watched television and stayed out of the way. It was clear that the children were not really welcome at that dining room table. On Friday nights, at the home of my maternal grandparents, things were very different. I remember feeling like a big shot because I got to sit at that table all night. All we had there was coffee and dessert, but man was that fun. When they played cards, or any other game, we played too – even pinochle. When there was a conversation, we were included. I think I learned most of what I know about cars listening to my dad talk to my grandpa who was the local mechanic. When they ate, we ate. I’m pretty sure the first time I ever tasted coffee (I am convinced that my grandmother ALWAYS had coffee on) was during one of those Friday nights. Where do you think my brother and I liked to be more, and where do you think we needed to be dragged to go? We wanted go to the table where we were welcomed, and fought to go to the table where we weren’t. There is a level of intimacy that happens around a table that truly brings us together. Sociologists tell us that this is why we “do lunch” to get things done. There is a bonding that happens over a meal. They also say that is why first date dinners are so popular, why family dinner times are so important, and why we invite people over for pie when we want to get to know them better. Maybe that is why we include Banana Bread in our welcome bags to people who visit our congregation. There is something about food that brings us together. Jesus knew this very well. Often in the gospels we read about Jesus getting into trouble for eating with people that he shouldn’t. The “religious leaders” used to poke at him, asking his disciples things like, “Why does he eat with tax collectors and sinners?” (Mark 2:16, et al.). sharing a meal with somebody – had a significance in Jesus’ social world that is difficult for us to imagine. It was not a casual act, as it can be in the modern world. In a general way, sharing a meal represented mutual acceptance. Pharisees (and others) would not eat with somebody who was impure, and no decent person would share a meal with an outcast. The meal was a microcosm of the social system (Borg 55). When you ate with someone in that culture, you indicated your acceptance of that person, and your desire for an intimate friendship. This was especially true if the meal took place in a private home. (Roberts). When Jesus invites himself to Zacchaeus’ home for a meal. That is a big deal. 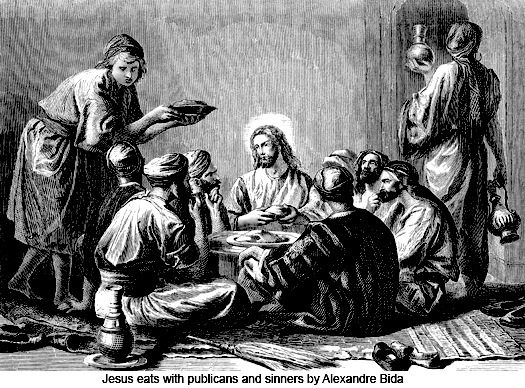 When he eats with Matthew and his fellow “tax collectors and sinners,” Jesus is accepting them. When a woman with a questionable reputation comes in to where Jesus is eating and begins to wash his feet with her tears and dry them with her hair, that is huge in the society of the day. So you can understand why the religious leaders are troubled by the people with whom Jesus chooses to dine. He wasn’t just eating with them, he was accepting them as they were. Then when the time comes, Jesus sits down with his disciples for the last supper, and he opens with those words, “You’ve no idea how much I have looked forward to eating this Passover meal with you” imagine what it must have meant to the disciples. They admired him. They thought he was going to be king – remember how Pastor Bob said several weeks ago that Peter’s confession that Jesus was the Messiah was like saying, “We think you could be president.” Here he was, this very special person of God, whom they had seen do miraculous things, welcoming THEM to his table. He was accepting them for who they were. He was telling them how much he wanted to be with them when he welcomed them to his table. Like going to my grandparents on a Friday night, and knowing I was welcome at the table, I knew I mattered. The disciples must have been moved. This was “inner circle” time, private time with Jesus, intimacy with their teacher, a special moment. Jesus in those few words, is inviting them in, reaching out to build deep, intimate relationships with them. They are welcome at his table. They are important members of his family. He is inviting them into intimate friendship. He is telling them that he accepts them as they are as he accepts them at his table. 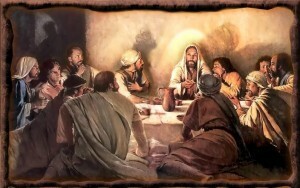 Jesus accepts the disciples, the tax collectors and sinners, those we think deserve it, and those we are pretty sure don’t – he accepts all of those at this table. So too he accepts all of us as he invites us to come to this table today. I love that line Pastor Bob uses when he explains that in the United Methodist Church we celebrate an open communion – meaning that the only requirements are that you love Jesus, repent of your sin, and seek to live in peace with others. He says something like, “this is Jesus’ table, so we don’t set the guest list. He does.” And apparently Jesus is not so discerning about social or religious status before he welcomes us to his table. He invites us all. Like the host inviting people to come to his banquet in Jesus’ parable told in Luke 14, Jesus says, “compel people to come in, so that my house may be filled” (Luke 14:23). There is room at Jesus’ table for us all. I know that doesn’t sound weird anymore, we’ve heard it so much, but that is weird. If you went to dinner with a friend and the waiter came by and filled your cup until it overflowed, that wouldn’t be a blessing that would be a mistake. Again, some sociological context will help. 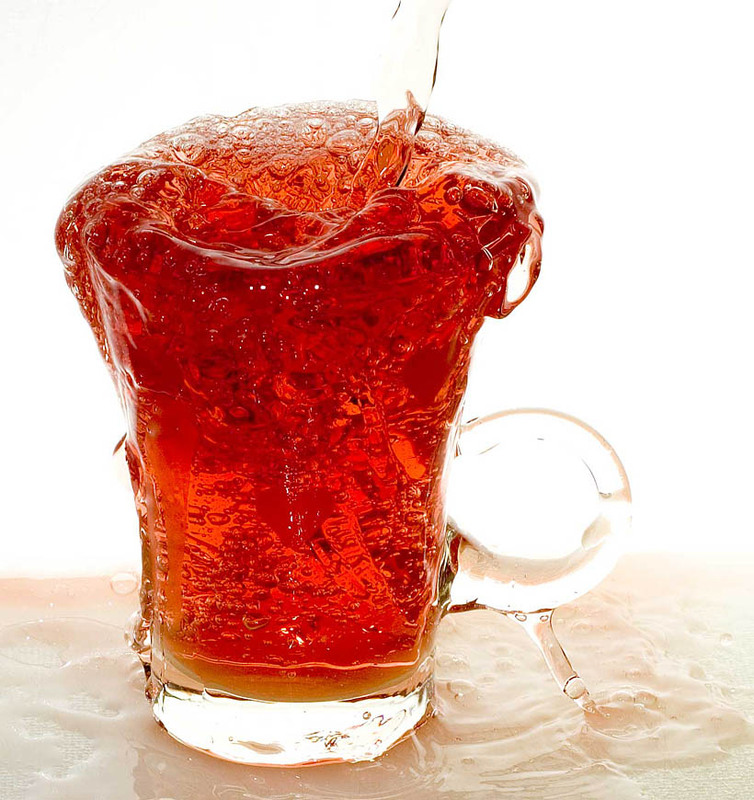 The overflowing cup was a powerful symbol in the days of David (traditionally understood as the author of the Psalms). Hosts in the ancient East used it to send a message to the guest. As long as the cup was kept full, the guest knew he was welcome. But when the cup sat empty, the host was hinting that the hour was late. On those occasions, however, when the host really enjoyed the company of the person, he filled the cup to overflowing. He didn’t stop when the wine reached the rim; he kept pouring until the liquid ran over the edge of the cup and down on the table (Lucado, 137). When Jesus welcomes his disciples to the last supper by saying, “You’ve no idea how much I have looked forward to eating this Passover meal with you,” he is telling them that the cup is full to overflowing. They are welcome to stay. The company exceptionally pleases the host. And so he is saying the same thing to you and me. I don’t know where you are today. Maybe you have come here wondering if you belong. Maybe you have come for the kids’ sake. Or maybe you came today because your spouse strongly encourages you to be here. Or maybe you came out of desperation, searching for something. Or maybe you came, and you have no idea why. The invitation of Jesus is for you. He is filling your cup to overflowing. He is welcoming you to his table. He is accepting you where you are right now, and inviting you into a deeper relationship with him. Jesus wants to be here with you. When you come to receive that piece of bread and dip it in the juice this morning, may you come with those words of Jesus ringing in your ears, “You’ve no idea how much I have looked forward to eating this Passover meal with you.” Truly you and I have no idea just how much Jesus longs to be in deep relationship with each one of us! And there is no better way to make that invitation than to invite us to eat a special meal with him. With or without the casserole dish. Borg, Marcus J. Meeting Jesus Again for the First Time: The Historical Jesus and the Heart of Contemporary Faith. San Francisco: HarperSanFrancisco, 1995. Lucado, Max. Traveling Light: Releasing the Burdens You Were Never Intended to Bear. Nashville: W Group., 2001. Roberts, Mark D. Feasting Together, “1. Eating Together Augments Intimacy” sermon © 2004 by Mark D. Roberts at http://www.markdroberts.com/htmfiles/sermons/10.10.04.htm.